When the team lineup for the NPSL Founders Cup first leaked, one of the names on the list that surprised some folks was the Milwaukee Torrent. Those who know Torrent owner Andreas Davi’s resourcefulness and determination to operate a professional club would have been less surprised. The Torrent were founded by Davi three years ago. A former professional player who grew up in Bayer Leverkusen’s youth system in his native Germany, Davi still retains a link to their academy with the Torrent. Called on by the league to help launch a new conference, he bootstrapped the club for its first season in the National Premier Soccer League in 2016. Davi quickly assembled sponsors to help fund his operation and ran the team himself. Davi’s sensibilities of what a soccer club should look like come from his time with Leverkusen. The Torrent featured paid players from the start, even if on modest wages. 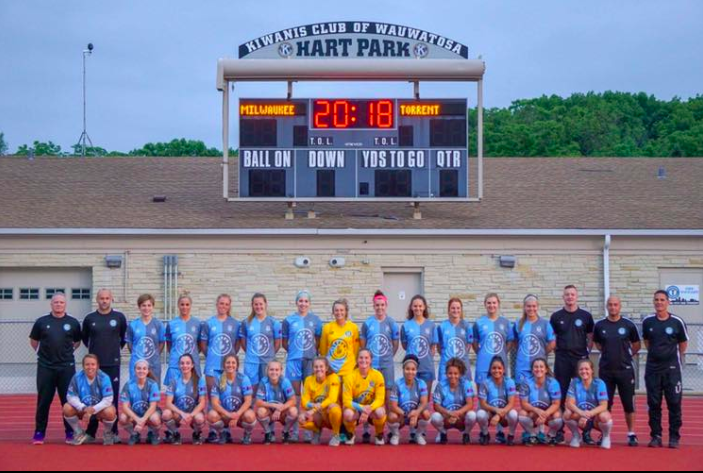 After two successful years running a men’s side, the Torrent added a women’s team in the WPSL for the 2018 season. 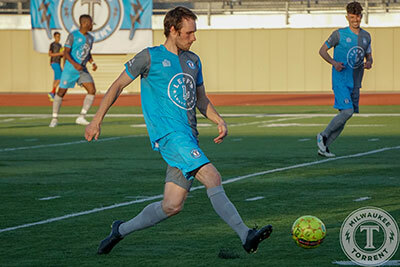 While the team technically plays in Wauwatosa, Wisconsin, the Torrent’s home venue, Hart Park, is located just 15 minutes from downtown Milwaukee. Despite featuring a track around the field, Hart Park turned out to be a major upgrade for the Torrent over its prior home due to the fact that it is situated in a neighborhood with bars and restaurants within walking distance from the stadium, and there is plenty of parking for fans who prefer to tailgate at games. As the Torrent prepare for the Founders Cup, they have negotiated a favorable deal with the city that will allow them to take on greater profits from ticket sales, concessions and beer sales on match days. These additional revenue streams as well as expected increases in sponsorship due to the higher quality of the competition, will help Davi fund the club at a higher level while he continues to look for investors who share his vision for a professional soccer club in Milwaukee. We spoke with Milwaukee Torrent owner Andreas Davi about the NPSL Founders Cup, and his vision for what the future holds for pro soccer in Milwaukee. 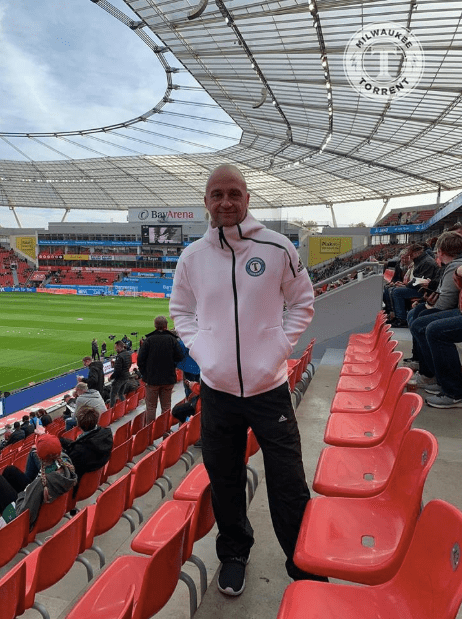 Milwaukee Torrent owner Andreas Davi at Bayer Leverkusen’s stadium. The Torrent have a relationship with the Leverkusen academy. 1. The Milwaukee Torrent are only a few years old. How did you come to be a part of the “NPSL Pro” project? We were one of the teams who were already paying players. I was always interested, when I started the Torrent, to have a team that plays year round. I wanted to do this from the beginning, to build up to it. I didn’t feel it was right that only people with a lot of money [to meet the USSF Pro League Standards] were able to play all year round. We have teams in the league that do a good job and create revenue streams to fund their own operations. So this was my goal. When I started the Milwaukee Torrent, I did everything myself. I wanted to bring the Torrent to this point that way. However, I cannot do this by myself anymore, nor do I want to. Up until now it was myself and an advisory board. I am bringing in an a business manager and a chief financial officer to help grow the club. We are working with a marketing company to help us get the name out locally. We are creating relationships with local universities. We are going to have a press conference on December 18th to help us share the plans for the Torrent with the local Milwaukee market in more detail. 2. ASC San Diego just announced that they added some new investors to make this jump. Did you also do this with the Torrent? We have run the numbers and we do not need additional investment into the club to support our efforts for the next couple of years. However, we are open minded to adding additional investors into the ownership group, and will look to do that with the right set of partners. We are ready for the next level now, however. 3. Currently you play in Hart Park just outside of Milwaukee. Do you have plans to continue there, or do you see moving into the city at some point in the near future? One of the big factors that we have going for 2019 and beyond is that we have will greater control our revenues at Hart Park. It is very close to downtown Milwaukee and it is right off the interstate so it is very convenient to get to. There is plenty of parking. There is a great area for tailgating. You have bars and restaurants within walking distance from the stadium. We have good locker rooms. We will be in charge of gates, concessions and beer sales at games at Hart Park. The only negative is that there is a track around the field. The issue in Milwaukee is that there is no stadium downtown that is suitable for soccer. We are happy to be in Hart Park. We have a great relationship with the city, which controls the venue. 4. In addition to the men’s team, you also have a team in WPSL. What has adding the women’s team meant for the Torrent? What does taking the men’s team to a higher level now mean to the overall operation? The first year of our WPSL team was better than I could have hoped. We had a good record. We were able to get good players from the local colleges and over 600 people per game. I started the Torrent because I wanted both boys and girls in the local area to have something to look up to, so the women’s team is just as important to me as the men’s team. There are so many girls who play soccer in the state of Wisconsin and they deserve the opportunity to play the game at a high level. Adding the women’s team also gave the club a boost in sponsors. I would like to take the women’s team to a professional level in the future. Perhaps one day the WPSL will do something like the NPSL is doing now. There are definitely other teams in the WPSL who would also like to play a longer season just as Torrent would. 5. What steps do you have to take between now and August to be ready for the NPSL Founders Cup? We need to bring in quality players from Wisconsin but also from outside of the state. We need to ramp up our marketing efforts. We are building out a front office. We are looking to start a fan shop. We need to sell more sponsorships commensurate with the level we will be playing at in the NPSL Founders Cup. We need to get season ticket sales going as we have been on hold on that waiting for the league plans to finalize. We have a large season ticket commitment for next year already from local youth organizations that will help boost our attendance in the Founders Cup. 6. What kind of team can we expect to see on the field with the Torrent for NPSL Founders Cup? Where will you source the players from? We are going to play at a higher level of competition than we have before. We will obviously raise the salary ranges for players to compete versus what we paid in classic NPSL. The team will look very different from this and last year to be competitive at this level. We understand that we need to perform on the field in the Founders Cup in order to grow the club. We also want to find players with the right type of character to represent the Torrent at the the correct level of professionalism. 7. You have a relationship with Bayer Leverkusen dating back to your playing career, that has continued with the Torrent. You take some kids over to Leverkusen every year to train and have coaches come here for camps. Will we see this connection grow now that the Torrent are taking a step up? Our relationship is really with the youth academy. Of course this is something that I am looking into, but it is not easy because you have deal with issues like visas. I am not sure it is something we can do in the first year, but perhaps in future years if there is the right fit with a U-19 player they want to get playing time for, as an example. We have also heard from Borussia Mönchengladbach who are interested in having a similar relationship to what we have with Bayer Leverkusen, with youth camps, etc. They also want to expand their brand in the United States. Some of the other German teams are more focused on Asia right now. 8. Have you put any thought into how you will increase marketing for the Torrent now that you have a bigger platform with “NPSL Pro”, so that more people in the Milwaukee area know about the team? The Zizzo Group, the marketing company that we have hired, is working on our outreach strategy. The press conference on December 18th will start the ramp up of our efforts locally. 9. You have some marquee teams in “NPSL Pro” alongside the Torrent, such as the New York Cosmos and Miami FC, as well as Detroit City a little closer to home. How do you think the market will respond to playing bigger clubs? We are happy to be in the league with our conference mates Detroit City FC, as it is good to foster that rivalry. Rivalries are important. The name New York Cosmos should bring additional fans into the stands for sure. We are lucky in that we have all of these great teams in the league that should draw fans out to matches with the Torrent.